After millions of years of evolution, our species has, like an aging rock band, settled into a comfortable, familiar groove: Your classic bipedal, theory-of-mind-having Homo sapiens. Then, there is another class of human. This class of human has spectacular powers, such as mind control or the ability to manipulate electromagnetic waves, and exists mostly in big-budget global superhero franchises, like X-Men (or in mid-budget Ben Stiller-starring cult classics from 1999, like Mystery Men). These characters aren’t generally celebrated for their realism—but are they really so implausible? Is it so hard to believe that, in some late-career burst of creativity, human beings might finally get it together and start evolving some wings, or night vision, or whatever? For the latest installment of Giz Asks, we asked evolutionary biologists, academics, and futurists if it is at all possible that people with superhuman abilities are living amongst us, or one day will, and which of these abilities are the most scientifically plausible. They let us know that while mutant-humans probably aren’t evolving alongside us, there are certain scenarios (a move to Mars, say, or wide-scale climate-related devastation) which might bring about humans with radically different genetics in the distant future. Or, via genetic modification, in the next few months. Scott Solomon is a biologist, professor, and writer; author of Future Humans: Inside the Science of Our Continuing Evolution; he currently teaches ecology, evolutionary biology, and scientific communication as a Professor in the Practice at Rice University in Houston, Texas. It’s unlikely that natural selection is currently operating to give people telepathy or mind control. And it’s fair to say that traits which defy the laws of gravity, like flight, are unlikely to ever evolve in humans. But one thing that’s being developed now is technology that allows us to make changes to our DNA, through the use of CRISPR/Cas 9 which is a way of editing genomes—including, in principle, the human genome. That is setting up a scenario in which, in the near future, it might be possible to make changes to humans and other organisms in very specific, deliberate ways... if we’re talking about traits that are at least physically possible. For example, humans are able to see within a certain range of light—we so call it the visible light spectrum, because that’s what we can see. But insects in some cases can see light that is invisible to humans—ultraviolet light, as an example. So that means that it’s physically possible for an organism to see UV light, we just don’t have the ability to do that, because our photoreceptor cells in our eyes aren’t attuned to those wavelengths of light. So if we knew all of the genetics that allow an insect to see light in the ultraviolet spectrum then at least in theory it might be possible to alter our own genes to allow humans to see light in the UV range as well. And likewise some organisms can detect heat in the infrared spectrum—for example some species of snakes, or some insects. So again if we understood the genetics of that, then at least in theory we could manipulate our own genes in order to allow us to do that. Whether or not we should do that is a whole other question. But history seems to suggest that when humans develop the ability to use a particular type of technology, we tend to use it. For a new species of human to evolve [naturally], there needs to be some sort of reproductive barrier. There would need to be something keeping this other type of human from mating with us. The current trend, on earth, for humans, is for populations to be coming together and mixing their genes... But if you send some people to Mars, and they start adapting to conditions there—whether through natural selection, or deliberately editing genes to try to make it easier for them to live on other planets—that might lead us down a path where you have a new species evolving. It’s all about super-soldiers. This is what the holy grail is going to be: getting that better military creature. Nothing is more efficient than biological structure—no silicon, no metal. A soldier who’s much harder to bleed to death, or a soldier that doesn’t need to drink as much water, or doesn’t need to eat for five or six days, or doesn’t need to sleep—any one of these things would be an enormous advantage in warfare. [With CRISPR/Cas 9] you can put a new gene into an organism, or you can tweak a gene and turn it on where it had been turned off, or turn it off where it had been turned on. The most important genes are regulatory genes—they’re like generals that control hundreds of other genes, and so just by messing with one of them you could change entire swaths of what an organism looks like or how it behaves. At the same time it turns out that there is a means of causing change that is not Darwinian. Lamarck is always ridiculed in evolution classes—he’s the guy that said that the reason giraffes have long necks is that giraffes would stretch their necks every day, and stretch and stretch and stretch, and all that stretching led them to produce babies with longer necks. Ha, ha, ha. But in terms of behavior, it turns out that he wasn’t as wrong as we think. We’re finding more and more that, for instance, people who have gone through combat, or women who have been abused—when you have these horrendous episodes in life, it causes permanent change, which is then passed on to your kids. These are actual genetic shifts that are taking place within people. It’s called epigenetics, and that too can cause huge evolutionary change. On a larger scale, the amount of stress that Americans are going through now, because of Trump—there is going to be an evolutionary consequence. President of the World Futures Studies Federation, Adjunct Professor at the Institute for Sustainable Futures (University of Technology, Sydney) and author of The Future: A Very Short Introduction & Postformal Education: A Philosophy for Complex Futures. Today’s transhumanists claim that the only way for humans to have superhuman powers is through technological, biological, or genetic enhancement. The more extreme views of human-machine interface include cyborgs; Ray Kurzweil’s singularity – the idea that human functioning can be technologically advanced exponentially until convergence; and Elon Musk’s neural lace, which merges the human brain with AI. All these ideas are still in the realm of science fiction, yet they are attracting hundreds of millions of dollars in funding. Ironically, the idea of human beings evolving superhuman powers is not new. Friedrich Nietzsche wrote in 1883 about the Übermensch translated as: ‘Superman, Ultrahuman or Higher-Person.’ His ideas integrated Darwin’s biological evolution with the German Idealists writings on evolution of consciousness. Like Nietzsche, French philosopher Henri Bergson wrote in 1907 about the Superman arising out of the human being, in much the same way that humans have arisen from animals. In 1950, Teilhard de Chardin wrote about the Ultra-human or Trans-human, but his transhumanism was humanistic and spiritual, not high-tech. Australian-based member of the Evolution, Complexity and Cognition group at the Free University of Brussels, author of The Evolutionary Manifesto and Evolution’s arrow: the direction of evolution and the future of humanity. It is also highly implausible that super powers could be enabled by changes within the bodies of humans. The current laws of physics and chemistry do not seem to allow for mechanisms in flesh and blood that could enable, for example, individuals on different continents to communicate as effectively as they can be using smart phones. Certainly the typical super powers possessed by mutants depicted in movies seem inconsistent with the known laws of nature. At present they are the stuff of science fiction and are likely to always remain so. I would say flight, mind control, telepathy [are the least plausible superpowers]. I’m not even sure how mind control and telepathy could occur (although you could say “mind control” if you have particularly charismatic people paired with heavily suggestible people). Flight would require us reshaping our body beyond just getting wings. We’d need much better chest/back muscles, and, I believe, a shifting in our center of gravity, which would be long-coming and difficult. Night vision might be the easiest, though it also won’t be easy or quick to come, just because our long ago ancestors were nocturnal. Could a new kind of superhuman conceivably evolve alongside regular humans? If this new kind of super-mutated human is still the same species as us regular people, then I would think it’s more likely that the mutation is caused by a recessive gene (think your little ‘n’ to a big N), and if they’re still breeding with us regular humans, you’d end up with fewer pure mutants (nn), more “carriers” (Nn), and regular people (NN). Whether they live alongside us depends on the scenario. Scenario 1: something bad happens so that regular people (NN or Nn) are being selected against and mutants (nn) are being selected for (so, let’s say, atmosphere is poisoned and the mutants are able to deal with the poison better than us regular people). In this scenario, you’d have mutants eventually overtaking us, because they’re being selected for by the environment. Scenario 2: mutation is neutral and mutants continue to breed with us regular humans. We’ll have a scenario where we’ll have three types of people walking around: normal people (NN), carriers (Nn), and mutants (nn). Scenario 3: mutation is actively harmful (being selected against). You’ll have a scenario where any mutants are taken out of the gene pool (maybe die early), and only carriers and normal people continue to survive. This is if the mutants are still the same species as us regular people. Either way, this would take a ton of time, so I guess your best chance of having mutants and regular humans living together at the same time would be having mutants be the same species as humans, but something happens with a gene that causes phenotypic differences and can be carried. Some superpowers are always going to stay firmly in the range of the fantastical; to quote Star Trek: ‘you can’t change the laws of physics’. So speedsters such as The Flash and Quicksilver are never going to be able to consume enough food to power their supersonic runs. Similarly Johnny Storms ability to (reversibly) turn into superheated plasma must stay firmly in the realm of fantasy, it needs just too much energy. However there are plenty of examples of ‘superpowers’ in nature, so we know that these are at least biologically possible. Kestrel may have some version of telescopic vision, which is achieved by just packing more light sensitive cells into the retina. Bats have echo location, like that used by Matt Murdoch (as Daredevil). Plenty of animals have what we might call supervision because of their ability to see in UV. 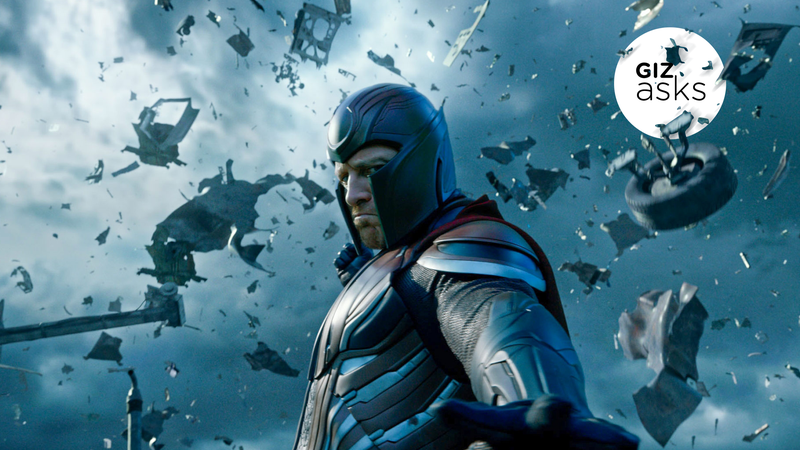 Then there’s Magneto, who can sense and manipulate electro-magnetic fields. This isn’t so far away from the abilities of electric eels, and even the humble pigeon can sense magnetic fields. There’s tons of evidence in the fossil record that [new kinds of humans have evolved alongside regular humans] in the past, so I see no reason why that couldn’t happen in the future. We used to the think that there was a linear trajectory from our fossil ancestors to contemporary modern humans, but the more fossils that are discovered, the more evidence we have to suggest that there was not just an ancestral branch or tree, but more of an ancestral bush of fossil species which went off in various directions and then for whatever reason—we still don’t know—went extinct. We’re the only living relative around today, but we have lost different species that existed and lived next to each other in time, though not necessarily in space. In terms of superpowers that we might evolve, or that I would like to see—it would build on what we already do. One side of the coin is that we’re incredibly gifted at killing each other. The flipside of that is that we’re also incredibly good at taking care of each other, and that is the reason why I think we’ve thrived as a species, because we’re social, and we work together, and we cooperate. So as we enter into this really tense and tenuous part of our history, when we’re in the Anthropocene, and the climate is changing, I’d really like to see us as a species, and globally as a community, develop our superpowers to go above our current level of empathy and compassion and imagination and ingenuity and really take them to heroic, comic book levels of innovation and policy-making and invention. We need to become our own heroes. Will Human Evolution Be Shaped by Climate Change? What&apos;s the Speed of Dark?